Welcome to the last frontier. 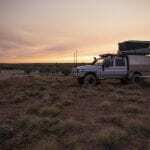 For anyone with a love of offbeat characters and equally unconventional adventurers, the Far West – a vast, remote stretch of country, 1500 kilometres or about 17 hours-straight drive west of Brisbane – is one for the bucket-list. Not only does it have a rich history, woven with wild yarns and eccentric characters, from lost explorers to Afghan cameleers and pioneering pastoralists, but equally strange natural marvels. For a town with a population of around 300, and literature that describes sightings as ‘rare,’ a surprising number of Boulia residents claim to have seen the natural (or supernatural, depending on your outlook) phenomenon of the Min Min lights. And if they haven’t, they know someone who has. The Min Min lights were first seen outside Boulia at a lonely Cobb and Co staging site in 1918 and to this day, there’s been no conclusive explanation for these balls of light that hover and dance above the ground, scaring cattle and hardy stockman alike. Everyone has a theory though, just ask around town and you’ll get the gamut – from fluorescent gasses to UFO activity. There’s no point looking for the Min Min lights though – as everyone will tell you – the capricious lights are said to look for you. For a sense of what they’re like without the fear factor, head to Boulia’s biggest attraction – The Min Min Encounter in the main street. It’s kitschy good fun, with animatronic characters, drovers “Gunna” and “Bluey” describing their sightings, while other characters expound on some of the theories proposed over the years to explain the mystery of the lights – from the scientific to laughably lunatic. Considered the most unusual of Australia’s deserts, Diamantina Channel Country is a riverine desert and a spectacular natural phenomenon. In the dry, its endless shimmering plains of desiccated gibber grass seem unlikely to support any life at all. 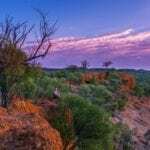 But in the wet, the vast network of veins of shallow interconnecting channels and creeks fill and spill across 95,000 square kilometres, swelling waterholes and, attracting up to 450,000 birds including packs of chattering zebra finches, Australian bustards and even the extremely rare night parrot. In fact, the wildlife here significantly outnumbers the human residents with just 300 people and 11 mega cattle stations (some bigger than Singapore or Vanuatu) calling the region home. Conversely, there are many blink-and-you’ll miss ‘em towns in this part of Queensland. Runner up is Middleton (population: 2), home to the Middleton Hotel or ‘The Hilton Hotel’ the cheeky name for a bare-bones camping ground in the red dust across the road from the most remote pub in Queensland. Even if you’re not staying the night at ‘The Hilton’, you should make it a point to call in to the historic Middleton Hotel, between Winton and Boulia to have a cold one and a yarn with the laconic, akubra-hatted Les Cain and his wife Val. Middleton may be small, but the gong for Queensland’s smallest town goes to Betoota. Despite having a satirical online newspaper named after it, (The Betoota Advocate), the sign welcoming visitors to Betoota reads “population 0”. A former customs post and Cobb and Co. change station in the late 1800s, the town’s population dwindled, only saved from the title of ‘ghost town’ thanks to the presence of sole resident, Sigmund (‘Siggy’) Remienko who ran the Betoota Hotel for 47 years. He died in 2004, bequeathing the hotel to friends but it sat empty until 2017 when it was bought by Brisbanites, Robert Haken, a smash repairer from Logan, friend Carol Norman and another couple of mates. Currently, Carol says, they’re looking to re-open the pub in time for the tourist season in March 2019. 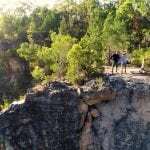 The hoteliers’ presence and a couple of live-in staff mean that the population of Australia’s smallest town has swelled to four. Or five if you count ‘Siggy’ buried around the back, as loathe to leave the place in death as he was in life. The UK’s Stonehenge is known for its mysterious Neolithic monuments but in Australia’s own Stonehenge, history is written in stone in a far more literal way. Add your name alongside other worldly wanderers in the stone address book, found two kilometres out of town on the Longreach side of the sealed Stonehenge turn-off. You’ll know you’ve found it when you come to a wide, flat area and spy messages and addresses fashioned from stones. 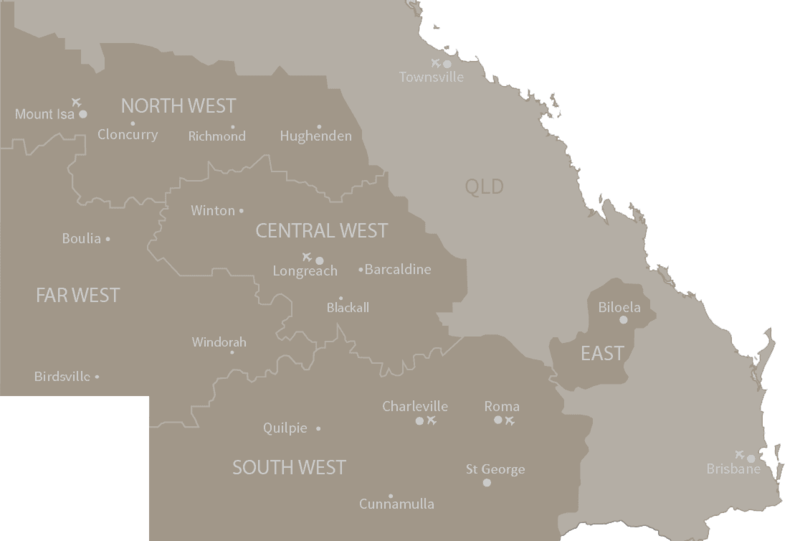 Getting here: The Far West is a 14-hour drive west of Brisbane along the Warrego Way or Adventure Way. Despite its small population, there’s a lot to do in Queensland’s Far West region – from music festivals to race meets celebrating everything from camels to crustaceans. 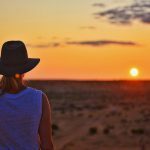 Australia’s first and only 250km multi-day race, the Big Red Run’s course traverses desert sand dunes, open gibber plains, clay flats and salt lakes, and attracts adventurous runners from all walks of life. Boulia’s ‘Melbourne Cup of The Outback’ is run over 1500m with the mighty ships of the desert (who can weigh up to 800 kg) on occasion getting their diva on by refusing to move out of the starters gate or deciding to run the wrong way around the track. Held at the very edge of the Simpson desert with the backdrop of the desert’s highest dune, affectionately called ‘Big Red’, the family-friendly, dog-friendly camping-under-the-stars music festival attracts some impressive Aussie acts like John Farnham and the Hoodoo Gurus. Camels are the animal of choice at the annual Bedourie races, run over six events. There’s also pig racing and a traditional camp oven cook off. It may be Australia’s smallest town, but come August, it positively throbs with life as travellers descend for the famous Betoota Races. Held in the main street outside The Western Star Hotel in Windorah (population 114) the Yabby Races with local blue claw crustaceans competing inside a ring have been a fixture in the town for 10 years. The town, generally boasting a modest 130 residents swells to as many as 7000 each September as travellers descend to attend the races, held here since 1882.